Rigid LED Interior Lights UNIVERSAL - Dezod Motorsports Inc - Home of the automotive performance enthusiast since 2002. Rigid LED Retrofit Kit is designed as a retrofit light for recreational vehicles. Kits are available between 350-400 raw lumens and is recommended for larger spaces. This RV retrofit light produces approximately 30% more light than it’s bulb equivalent while drawing a fraction of the power. 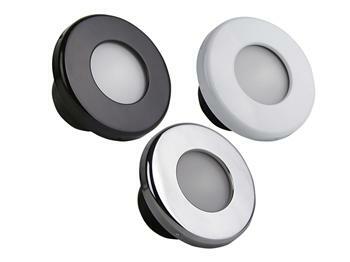 Available with a number of different bulb adapters and has a 2 year unlimited warranty. This LED Dome Light features powerful LED’s and is designed to be used as interior or exterior small area lighting. Use the LED Dome Light in the cab of your vehicle, under your hood, or on the wakeboard tower of your boat. It features billet aluminum construction with a black anodized finish. Rigid Industries LED Lighting is proud to present Courtesy Lights for all you marine lighting needs, LED color options include Primary White, and Secondary Red or Blue, also these lights come in 3 different exterior color options to choose from black, white, and chrome and feature a smooth flood pattern for virtually any application.